Arena Coliseo de Guadalajara hosts twice weekly shows, using CMLL talent in the top matches and local wrestlers from the attached training school underneath. Arena Coliseo Guadalajara's school is a feeder system to the main arenas in Mexico City. The shows are currently held on Tuesdays and Sundays, though there have been periods of times where the Tuesday show was moved to Fridays. As of 2015, the Sunday show only includes uses local Guadalajara luchadors with none of the Mexico City talent. The arena was opened on June 20th, 1959 with a boxing event. 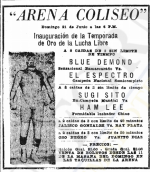 The first lucha libre show took place the following day, and was headlined by Blue Demon facing El Espectro. The building took two years to build. It's owned by CMLL itself and managed locally. This building can hold up to 7,400, though it's usually far less. Arena Coliseo Guadalajara's address is Medrano 67, Delegacion San Juan de Dios II, Colonia Analco, Centro, CP 44100, Guadalajara, Jalisco, México. Their phone number is +55 33 3617 3401. A weekly wrestling show from Guadalajara aired for many years, though not much is known of the show and only scattered recordings of the show exist. The show existed around 2005, and a local show was airing as late as 2013. These were primarly Tuesday shows, though it was also believed a local Televisa affiliate was airing the Sunday shows at one point. CMLL began handling recording of the shows, or at least the Tuesday ones, themselves in the early 2010s. It's believed they were recording full shows, though most of the matches were not seeing air anywhere. CMLL's show on 52MX (Guerreros del Ring (TV Show)) started airing the top three matches from the show midway 2014 thru midway 2015. The local Televisa affiliate began airing the Tuesday night matches again at that point. This page was last edited on 17 September 2015, at 20:53.